Nearly forty years ago, Ridley Scott made a little science fiction film with an H.R. Giger model. That little film launched the Alien franchise, a science fiction staple which now comprises live action films, comic books, video games, and toys. Now in his 70s, Scott has decided to bring the franchise full circle with Alien: Covenant and its sequels (prequels to the original series). Set ten years after the events of the semi-prequel Prometheus and some time before the fateful journey of the Nostromo, Covenant is rumored to include direct links to the original film it is slowly creeping towards. 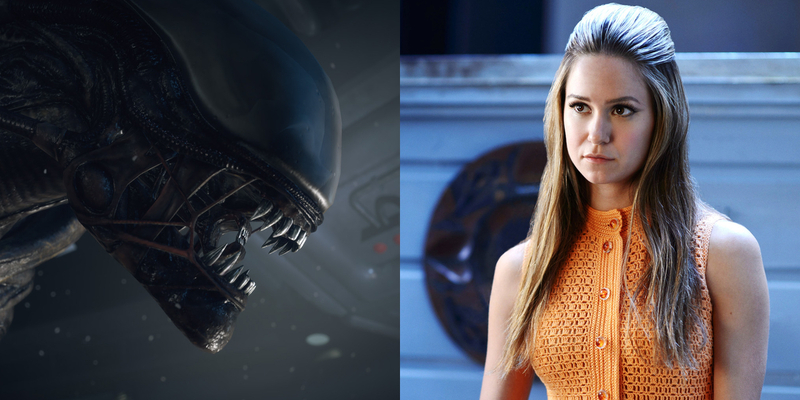 And one of those links may include some serious SPOILERS about the mysterious character played by actress Katherine Waterston. The Playlist has reported a serious bombshell about the actress’ role in the upcoming Prometheus sequel from their sources, supposedly close to the film (and Waterston). The mystery heroine was teased in a familiar setting in recent set photos, but the rumors go farther, claiming Waterston is playing none other than Ellen Ripley’s mother. The new film's synopsis lists the Covenant as a colony ship headed for an idyllic planet on the outer reaches of the galaxy. What they discover, apparently, is far closer to Hell than Heaven though. Early set photos have also revealed the logo of Weyland-Yutani, the corporation responsible for sending the Nostromo into the extending jaws of the titular xenomorph. Further shots included a look at a possible climactic battle, with humanoid and alien figures disturbingly frozen in mid-action. With strong connections to its forebearers already, having a Ripley on-board Covenant wouldn’t be entirely surprising. Early speculation centered on a possible connection to Ripley winding up aboard the colony ship. Long before production began, Scott teased that the Prometheus sequels would tie directly into the “backdoor” of the film. However, most assumed the legendary director would create a slow burn of a buildup from Covenant through its two potential sequels. It’s now possible that Alien: Covenant could introduce Ripley as a child, or at least Ripley’s mother into the equation, providing a direct lineage to the original Alien. Keep in mind, though, that the source is unconfirmed at this point. IMDB currently lists Waterston as a character named “Daniels.” Of course, many films misleadingly name their star characters – especially ones with as much significance as the mother of Ellen Ripley (Sigourney Weaver) herself. It’s also possible the rumors are slightly off, and one of the other unnamed characters will play Ripley’s mother. If the rumors are true, the presence of Ms. Ripley means the Alien and Prometheus worlds would collide much sooner than expected, likely to the delight of fans everywhere. That is, assuming Scott connects his two worlds in a satisfying manner. Alien: Covenant opens in U.S. theaters on August 4th, 2017.